This video is an accompaniment to my column in the April 2009 issue of Popular Woodworking Magazine. 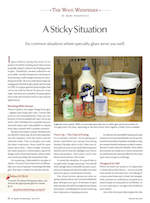 The article serves as a general review of common woodworking glues and when to use them. The video, however, focuses specifically on urea resin woodworking glues. These glues definitely have their advantages: low water content, gap-filling, long open time, and rigid glue lines just to name a few. But keep in mind the one big disadvantage: safety. These glues are pretty nasty and you might be best served considering other options. But with proper precautions (gloves, goggles, and respirator), this glue can be a nice addition to your shop. The two brands I use are DAP Weldwood, and Unibond 800. Why not just use contact cement? You can use contact cement and many folks do. Personally, I prefer the rigid glue bond offered by other glues. Contact cement is just a little too rubbery for my taste. Hey Marc are there any formaldihyde free resins out there? If not are there other options for veneering? One of the best things about urea resin glues is that they don’t creep under pressure or heat. So, for example, if you’re laminating up a pair of water-skis, this would be the glue to use. Very good info Marc, by the way what is the slowest setting PVA glue commonly sold and what is the set time? Good information about the glue. You mention using a respirator, any special filters for it when using the glue or sanding? Second question, what is the shelf life of the two part liquid? Thanks for the info. Hey Dan. I just use my standard organic respirator. Generally though, the standar particulate filter should be adequate. Its not so much fumes that we are worried about. Its the fine powder that gets airborne when stirring the mixture and sanding the dried glue. Shelf life on the resin is highly dependent on temperature. The website says 1 yr at 60F, 6 months at 75F, and 3 months at 90F. Well, that’s great. I’ll have to wear sweaters, so I can extend the life of the UniBond when I finally buy some. Hey Marc, whats the difference between Unibond 800 and Woodweld and the West epoxy systems? I know you use the West system a lot so why would you need these other two resin glues? The main difference between Weldwood and Unibond is the water component. Now you could certainly use epoxy for similar applications, assuming you have the slow cure variety. But the primary reason NOT to use the epoxy is cost. It tends to be significantly more expensive. And when you do veneering, you wind up using a LOT of this stuff. Marc, in the video you state you have both and use both. Given that the DAP product has too high a moisture content for veneer, what DO you use it for? I used to use the DAP for long glueups. The open time was real nice for that. But I don’t use it much anymore. I rely on epoxy for that anymore. Wow, this is an OLD video I see; as pointed out by VIC, you don’t mention in the video that only used Weldwood for the long OPEN TIME, and that you’ve largely quit using the Weldwood. I’m surprised you describe it as a poor choice for VENEERING, when that is possibly it’s #1 use… the first application in some of their instructions is ‘for veneering’. I found out my local paint shop carries Unibond, so I’ll try a pint of that tomorrow. My 10 y.o. Weldwood powder no longer liquifies when mixed. What’s shelf life for Unibond 800? Thx. Not sure on the shelf life. You’ll have to check with the manufacturer. As for Weldwood, I realize they recommend it for veneer and I’ve used it on veneer, but I’ve also seen bad things happen as a result of the water content in the glue. Marc, I noticed you have used Titebond II for interior pieces. Is there a difference between Titebond Original and Titebond II other than water-proofing and cost? Nope, that’s pretty much the only difference. But I usually buy TB II just because I never really know when I will need something with water resistance. Unfortunately no. I don’t know what he means by red powder resin. But you might consider something like epoxy. I just clean mine with water. In fact, during glueups I keep a small brush cleaning bowl nearby so I generally use one brush per project. Sorry to carry on about something so simple but in between glue ups how or where do you store it so it doesn’t dry out? Is it submerged in water or maybe in the glue? The brush cleaning bowl is filled with water. That’s where it sits between glueups. can you use resin to fix a delaminated hard wall on a rv? What do you mean by resin? Epoxy? If so, epoxy will bind to just about anything, so yes. Can Unibond 800 be used with paper backed veneer? I believe you can, though I’ve never tried it myself. Can’t see why it wouldn’t work. And a belated Merry Christmas to you too. Marc, One of the projects that I am making repeatedly are steam-bent laminated trout nets. I have been using TitebondIII and the Extend version. I steam form the lams days ahead of glue up so they dry thoroughly. I sweat through the glue up each time and sometimes have to prep the exotics like rosewood with acetone do to the oils in them. I had one glue joint fail and wonder if the would be a better glue for this application? I saw on a tv show Craftsman’s Legacy a man making a hand plane , he used salt as a grit to stop the wide flat peaces from shifting when clamping pressure was applied. Those old Woodworks episodes are still some of the best woodworking content ever produced! I watch them all the time. As for the glue, you certainly could use epoxy. Epoxy is just pretty pricey on a larger scale but there’s no reason I know of that you can’t use it for an interior bent lamination.